A filmography for Lee Kang-sheng is at the end of this article. There’s no way that you would ever mix up Lee Kang-sheng with Marcello Mastroianni. Their faces bear no resemblance, their acting styles are completely dissimilar, their wardrobes will never match. But in their impersonation of urban loneliness, mischievous melancholia and sexual alienation they are in a class of their own. Both have acted as alter egos for the modern masters of their time: Antonioni and Fellini in the Italy of the early ’60s and Tsai Ming-liang in the Taiwan of the ’90s. If I think of Fellini, the first thing I see is Marcello’s face, gazing at whatever passing fancy his eyes have captured in the streets of Rome. If I think of Tsai Ming-liang, the first thing I see is Kang-sheng’s face, gazing at whatever object of desire is forever leaving his world. If loss and absence are the two main themes of Tsai’s world, Lee Kang-sheng is the witness of all that’s gone, the one who yearns, ails and watches. Born in 1968, Lee Kang-sheng grew up in a poor family living off his father’s indigent civil war veteran benefits. He and his brother went to a private prep school. While his brother later became a student of film, Lee failed the entrance exam at the university and worked odd jobs as a waiter, an insurance salesman and a police lookout in front of an illegal gambling parlour. In 1989 Lee was spotted by Tsai Ming-liang on the streets of Taipei. Though he had no acting experience at that time, Lee agreed to take on a little role in Tsai’s TV-film All the Corners of the World (1989) about a family of movie-ticket scalpers. Next came the TV-drama Boys (aka Youngsters) in 1991 in which Tsai cast Lee in the leading role as a teenager blackmailing a younger boy for his lunch money. According to the film critic Chris Fujiwara, the film “has one scene – the teenager forcibly clipping the boy’s nails – that is perhaps the most shocking scene in Tsai’s work”. Next came Lee’s role in Tsai’s first feature film Rebels of the Neon God (1992), which established the nuclear family that will reappear in The River (1997) and What Time Is It There? (2001). Lee plays Hsiao-kang, the estranged son of parents who are played by Miao Tien as the father and Lu Yi-Ching as the mother. Beginning with Rebels, which charts Hsiao-kang’s dysfunctional family life and his attempts to approach another young man, Lee Kang-sheng perfected his performance as a “quintessentially disoriented, spiritually impoverished, socially isolated” (Shelly Kraicer) Taipei drifter. The passivity of Tsai’s on-screen alter ego is not just an invention of the director, though. As Lee and Tsai often say in interviews it’s the outcome of a collaborative effort, which partakes of their artistic visions as much as of Lee’s unique acting style, personal memories and coincidences. The River is based on a personal experience of Lee’s who for nine months had a painful neck ailment similar to the one befalling Hsiao-kang in the film. Just before shooting for The Hole (1998) began, Lee’s father died. In an interview Tsai later said, “It was like another father of mine had died”, and that Lee’s sad face became the inspiration for What Time Is It There? 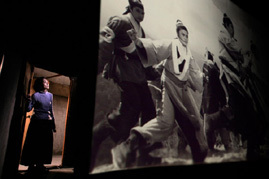 As this film was a kind of legacy of the death of Tsai’s own father in 1992, so is Lee Kang-sheng’s debut film The Missing dedicated to his own father. Tsai once told me in an unpublished interview that he would never make a film without Lee Kang-sheng but Lee already played in three films not directed by Tsai. A Drifting Life (1996) was his first film with Taiwanese director Lin Cheng-sheng. Different from his accustomed role as an urban loner, here he plays a man who after the death of his wife leaves his desolate cottage to work in the city as a construction worker. In Sweet Degeneration (1997), again under Lin’s direction, he gives his usual melancholic performance as a rootless young man returning from military service to Taipei. Ann Hui’s Ordinary Heroes (1998) was his first role abroad in Hong Kong. He plays the neglected child of an alcoholic mother who fights for better conditions among Hong Kong’s boat people. Lee once said that he thinks that had Tsai not approached him he would have ended up at the movies anyway because his brother was a film student. Not necessarily in front but rather behind the camera. His first chance to do so was as assistant director for Tsai’s A Conversation with God (2001), a short documentary on religious practices in Taipei. His first chance to work alone came at the beginning of 2003 when Tsai and Lee decided to direct two complementary shorts. Lee’s part of the project finally evolved into the feature film The Missing (2003) which garnered the prestigious New Currents Award at the Film Festival in Pusan in 2003 and a Tiger Award at the International Film Festival Rotterdam 2004 where the following interview took place. The Chinese titles of Lee’s and Tsai’s films added together spell out a common phrase which captures the artistic and personal bond between these films and friends in a beautiful and mysterious way: Bu jian bus san (“Don’t depart until we see each other”). Volker Hummel: The Missing and Tsai Ming-liang’s Goodbye Dragon Inn (2003) were originally planned as shorts to be shown together. What was the idea behind this project and how did it evolve? Lee Kang-sheng: The idea to make two complementary shorts evolved at the beginning of 2003. At that time I tried to get financing from a state funding agency, but in order to get funding you need to have a script so I wrote one for a short film. I didn’t get the funding but since Tsai Ming-liang read and liked the script we came up with the idea of making two complementary shorts that would last 60 minutes each. We had just finished filming What Time Is It There? and Tsai wanted to continue certain motives and locales of that movie, especially “the cinema”, which is the central place in Goodbye Dragon Inn. What happened was that Tsai’s film became too long so we decided to lengthen my film as well so we could have two separate films. Which meant that I had to make another couple of shots and lengthen others. VH: Did you change the basic premise of your film by prolonging it into a feature movie? LKS: It was a fairly difficult process because we even had finished the editing on the short. The main story line belonged to the grandmother. The boy and the middle-aged man in the video arcade didn’t play that much of a role. So I decided to create more of a contrast to the grandmother and I augmented the boy’s part. I shot more scenes with him and the middle-aged man, especially those in the video arcade. VH: Could you elaborate a bit more on the interconnections between The Missing and Goodbye Dragon Inn? A colleague of mine is sure that the characters of the grandfather and the boy with the balloon who we see at the end of your film are the same we see in Tsai’s film. LKS: Tsai’s film is about the vanishing of these old style cinemas in Taiwan, my film deals with the disappearance of inter-personal communication. So the main theme of both films is the disappearance and loss of certain things. There are several motifs in my film, which corroborate this thematic connection, one of them being the couple of the grandfather and the boy. VH: What did the first time director Lee Kang-sheng learn from the experienced actor Lee Kang-sheng? LKS: As an actor I am very familiar with one of the main activities of the filmmaking process: waiting. You have to wait for the lighting to be right, for the make-up to be applied, for the camera to be in the right position. As an actor you are always waiting. As a director I found that I had a lot more initiative because I was in charge. Every day there were many problems, many things I had to attend to and resolve on the spot. On a personal level I had to relinquish my slightly more passive attitude as an actor and become more active. What I learned from having acted in so many films is a certain knowledge or intuition of how far I can push actors, of what they will or won’t do. In that I think I’m better than other directors, I can bring actors closer to the best that they can do. VH: So you really enjoyed being in charge for once? LKS: It’s not necessarily being in charge of other people but as an actor you always have to do what the director wants, you have to be very obedient. You can say that being in charge is a way of rebelling against this obedience to the director. When you watch films you often have the feeling that they are not all that they could have been. You sense this latent potential that hasn’t been fully tapped. That makes you think about what decisions you would have made as the director. So for the first time I had this creative space that I could use to explore my own artistic intuitions and needs. As an actor your part in a film is always limited. A lot depends on your connection to the director, whether you relate to him or not. That is all you can give the movie as an actor. VH: How much influence did Tsai Ming-liang have on your film? LKS: He helped me in many different ways. We discussed the script and on quite a number of days he came on location. He was especially helpful in the editing process because he didn’t want people to come to see this film and think, “Oh, this is his first film”. He wanted people to think, “Oh, this is a good film”. He gave me a lot of support to make it a successful film. VH: What about anxiety of influence on your side? Weren’t you afraid that people would perceive it as a typical Tsai-movie? LKS: Yes, I was afraid that the film would be considered an imitation of Tsai Ming-liang. So I specifically asked him to give me a bit of space in which to make my own discoveries. And he gave me that space. On the other hand my film is hard to separate from his because the people in both are from the same family that has existed since Rebels of the Neon God. Of course there are intense relationships between them. What Time Is It There? is a film that deals with death and the loss of dear people, in this case that of a father, which was a way for Tsai to deal with the loss of his own father. But he used “my family” and I to do so. The Missing is an attempt to come to terms with the loss of my father to whom the film is dedicated. It is also a way of telling him that now he has a grandson, who is also in the film. Of course there are also a lot of other traces of Tsai Ming-liang’s cinema in The Missing – he is my teacher. I have worked together with him so many times. Maybe in the future more of my own style will come out when I direct more films. VH: What differences do you see between your own style of directing and Tsai’s? LKS: I think my visuals are different from his, my images are slightly stronger. There is also more of a narrative in the film. Regarding my style I think that’s also something for the audience to think about. I try to do something new and different, but it’s not up to me to decide how innovative I really am. VH: Maybe one can turn the whole question of influence the other way round. Tsai Ming-liang often said how your style of acting influenced his direction. So maybe you’re the inventor of Tsai’s famous style? LKS: Before he started to make feature films for the cinema, Tsai made a few TV-series. I saw them for the first time in chronological order at a retrospective of his work in New York. It really struck me then how from Vive l’amour (1994) onward the rhythm and speed of Tsai’s style really changed. The rhythm gets much slower, the takes get longer, and there is less and less narrative. I think that this change, this slowing down has something to do with my influence. I remember the first time we worked together. The first two days went by without any problems but the third day was really hard. There was one simple movement, I had to turn my head and look at something. I had already done that four or five times and he said those shots were no good and had to be redone. He said, “Lee Kang-sheng, can’t you be a little more natural in this movement?” I remember we were on location and that day was really cold. I got angry because we did that shot so many times already, and I said, “Well, this is how I naturally am”. I think that sentence was very important because up to that point he was probably working with the notion that there’s some kind of standard motion for someone who turns his head. And also that there’s a certain speed with which actors should talk. I did not have all these traditional notions of acting so I disrupted that way of thinking. VH: For me that’s one of the most profound beauties in modern cinema – how your and Tsai’s films allow the actors to find their own movements and spaces, to interact with their quotidian surroundings in the most mysterious ways. One of the basic formal decisions behind this temporal and figurative freedom is the long take. What makes you decide the length of a take? When is a long take too long? LKS: I think it depends on intuition. Of course as a director I would like the takes to be even longer. I don’t want to adapt to the expectations of the public, which is used to very fast editing and short takes. So it’s a matter of choosing between my own preferences, which are even longer takes, and the expectations of the public. VH: What is for you the beauty of the long take? LKS: That’s hard for me to say. I think that a long take can really bring out what is so beautiful about film. A long take can touch your life because you can see real life in it. In a short take, before you have the chance to really see something or somebody, it’s already gone. In a film consisting of short takes, in the end you have forgotten what it was all about because you have forgotten the images. In The Missing there is an uninterrupted 10-minute-take when the grandmother is looking for her grandchild in the park. For me it’s a very precious take, it was very difficult to do. I think it’s very true to life. And I’m very proud that we broke Tsai ‘s record. The scene at the end of Vive l’amour with the woman crying on the park bench lasts only seven minutes. VH: The scene in the park is also remarkable for the acting of Lu Yi-Ching as the grandmother. How much of her part, her words and movements, were scripted, and how much was improvised? LKS: The script was rather more like a synopsis, so improvisation played a large part in all scenes. I also did not try out all the shots beforehand on location. There is only one take of the 10-minute-scene in the park which was used in the film. There was no rehearsal and we couldn’t do it twice. I talked a lot to Lu Yi-Ching and told her she had to imagine what she would do if she had lost her grandson, what she would say, how she would move. I also instructed her where she could walk so the camera could follow her. It was hidden behind a hillock so its movements and reach were restricted. I told her where she could stand so she wouldn’t be hidden behind a tree. Then we waited for her to be in the right mood. It had to be this one take, not because of Lu Yi-Ching but because the people in the park couldn’t have done it a second time. VH: Were there other scenes made in this semi-documentary style? LKS: There is a scene where the grandmother jumps on the back of a motorcycle and orders the driver to drive through the streets. It was done in the same fashion, the people on the street and the motorcycle drivers were unaware of being filmed. Only the guy on whose backseat she finally jumped was an actor. He was also in What Time Is It There? as the homosexual with the clock, approaching me in the toilet. I wanted a fairly fat guy as a contrast to the skinny grandmother. We first went on location and filmed drivers on the street which you could call the documentary bit. When the grandmother appeared on the scene and tried to jump their backseats people reacted in very different ways. Some people would tap her on the leg to get off. Others reacted in much friendlier fashion and offered to drive her around. Of course we couldn’t use these takes because we were waiting for our guy who we had arranged would come in to the scene. Next to this actor we finally used a guy who pushes her off the bike and a plainclothes policeman who offered his help. VH: Why did you decide to work with the same actors that Tsai uses? LKS: It’s like we are a family now. We are not in filmmaking to make a lot of money. Lu Yi-Ching for example earns her living through a coffee bar that she owns. So, for her, playing in my movie is a way of giving a family member a helping hand. We really understand each other and share the same frame of mind. The Missing will screen at the Melbourne International Film Festival on 24 July and 27 July. Volker Hummel is a freelance journalist from Hamburg, Germany, who writes on literature and film. He is also author of The Vortex and a film festival programmer.